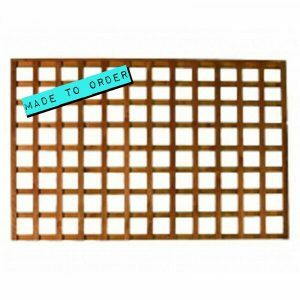 Trellis fence panels are popular due to their multiple uses. Trellis panels can be used to create dividing areas within your outdoor space giving a little privacy but with an open feel. 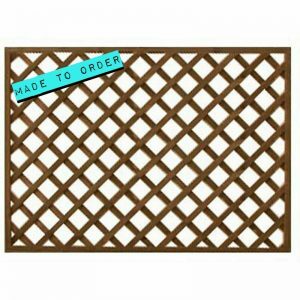 The lattice style is also ideal for climbing plants such as roses or ivy, creating a focal point for any outdoor space. Trellis can also be used to add to the top of an existing fence panel. Our trellis fence panels can be constructed in a square or diamond design depending on personal preference and in either a sawn timber or deluxe planed timber. Panels are fully pressure treated in either tanalised or brown. Deluxe trellis fence panels are tanalised as standard. Our fence panel sizes are shown as width first and the height. For example 6ft wide x 2ft high. If you don’t see the size of panel you require please give us a call for more details on our made to measure service. Most of our fence panels are made to order and therefore non-refundable. Please ask if you are unsure.